Steve Almond first brought to the attention to thousands of candy addicts across the world what he considered to be the best regional candy in America. 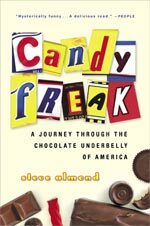 This list was detailed in his travels across the U.S., as he visited various confectionery companies, and then writing about his experience in the Candy Addictâ€™s bible, Candyfreak. Steveâ€™s highlights include Big Hunk, Idaho Spud, Peanut Chews, GooGoo Clusters, Valomilk, and Twin Bing. But after listening to Addicts across the world, he has compiled a new list of regional candy favorites. The last time I did a book report I think I must have been a freshman in high school. However, Candyfreak (it’s one word, not two) is definitely something I have had my eyes on for a while, but never had a chance to pick up until now. I first met Steve Almond, the author of the book, because a friend of mine had reviewed his first collection of short stories (Mr. Almond is more a fiction writer than he is a candy author), and she introduced the two of us. We went out for drinks and attended one of his book readings, and I can personally attest to him being a top-ofâ€“the-line guy. 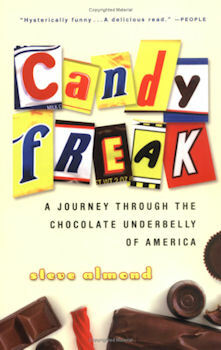 It wasnâ€™t until speaking with Steve and learning more about what he wrote that I learned about Candyfreak. The premise of the work surprised me, as the short fiction through which he had built a name for himself contained some very adult-rated material, i.e., not suitable for candy-loving children. True to my word, I told him I would buy and read a copy if he signed it, which he did, and the work sat on my bookshelf until now.